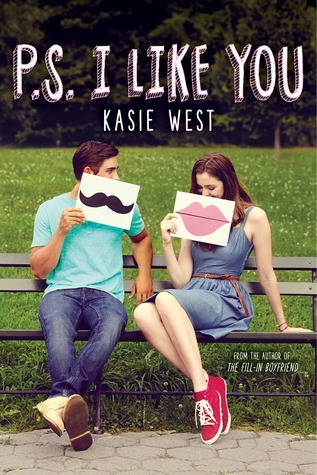 Just Pru by Anne Pfeffer was just plain fun from the start. Pru is one of a kind. She has her issues, but she's moved off on her own to try to overcome them. That's a super brave thing to do. I didn't like her parents. It seemed like they like her with her problems, and were in denial that she was getting herself healthy. They liked her dependent on them. I think she was healthier than she thought all along, and I blame a lot of that on her parents too. This was a cute and funny story. It showed how people can band together and become a community in times of need. I like to think we can do that in real life too. Adam has hang ups too. 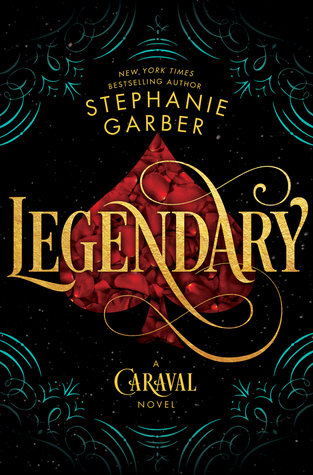 I could relate to aspects of both of their issues, so it was fun reading it in a story like this. 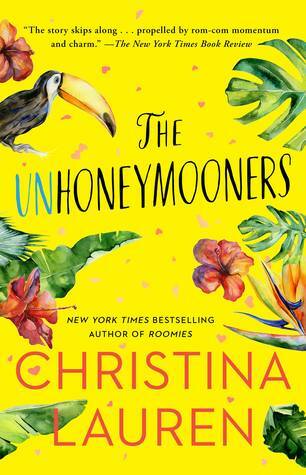 Read an Excerpt! 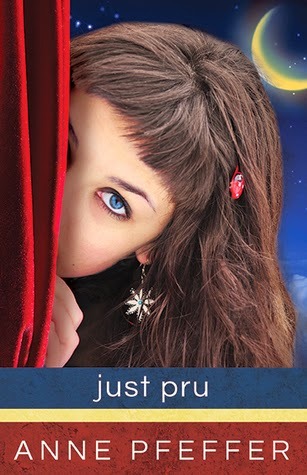 Just Pru by Anne Pfeffer was kindly provided to me by the author for review. The opinions are my own. 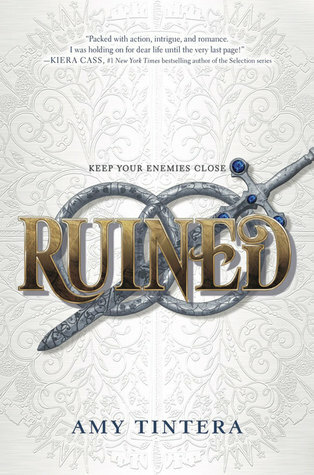 But not even Meena’s precognition can prepare her for what happens when she meets—then makes the mistake of falling in love with—Lucien Antonescu, a modern-day prince with a bit of a dark side. It's a dark side a lot of people, like an ancient society of vampire-hunters, would prefer to see him dead for. The problem is, Lucien's already dead. Maybe that’s why he’s the first guy Meena’s ever met that she could see herself having a future with. See, while Meena’s always been able to see everyone else’s future, she’s never been able look into her own. 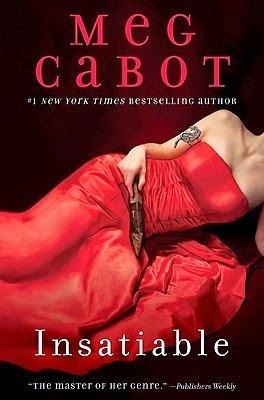 Insatible is book one in the Insatiable series by Meg Cabot. 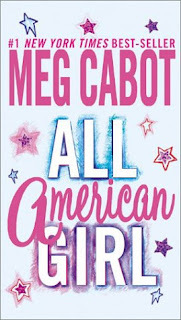 This is the first Meg Cabot book I've read so far, and it was pretty entertaining. 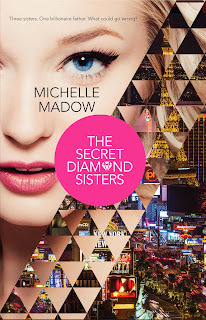 There were a lot of similarities to other book and tv/movie series that are out there right now. The overall story was goofy and fun though, so that made me wonder if the similarities weren't a round about way of making fun of the vampire popularity. It wasn't until after I finished reading the book that I watched the book trailers. Yup, the is definitely making fun them. Meena as pretty light hearted considering she can tell when a person is going to die. She's smart and knows what she wants. Lucien was dark and broody at times, but he too could lighten up. He's got a lot on his shoulders right now though so he has to stay focused. I liked his history. He's got the whole vampire swoony swagger thing down too. I didn't like Alaric at first. Yes, this looks to be a love triangle. Anyway, in the beginning, Alaric seemed pretty narrow minded and a touch self centered. I understand he has a chip on his shoulder because of what happened to his friend, but he let that cloud his judgement. As the book progressed he grew on me more and more. The only character that I wasn't too sold on was Meena's brother, Jon. He was just somewhat less than smart. Overall, Insatiable was a bit predictable, but still entertaining. I'm curious about what's to come next, so I'll be reading Overbite. the gleaming silver poles, hardly daring to believe her good fortune. It was morning rush hour, and she was running late. She’d expected to have to cram herself into a car packed with hundreds of other commuters who were also running late. the station, stepping into a car that was practically empty. Maybe, she thought, things are going to go my way for a change. above her head, which declared that she could have beautiful, clear skin if she called a certain Dr. Zizmor right away. Don’t look, Meena told herself. Whatever you do, don’t look, don’t look, don’t look. . . .
at all with another human being. . . .
was reading had Cyrillic writing on it. The giant roller suitcase parked in front of her was an additional clue that the girl was from out of town. blond braids onto the top of her head, The Sound of Music style, and had paired her cheap yellow polyester dress with purple leggings—was as dead a giveaway to her new-in-town status as what the girl did next. have done such a thing. Not when there were a dozen other empty seats on the train. One was that, despite the miracle of the nearly empty subway car, things definitely weren’t going to go her way that day. was going to be dead before the end of the week. 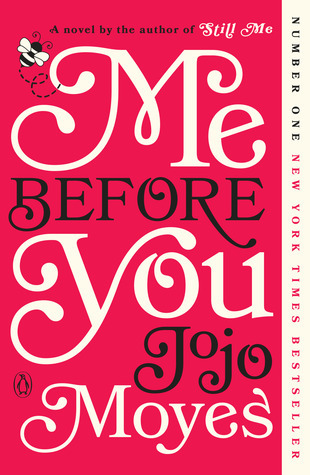 Check out my review of the next book in this series by Meg Cabot! 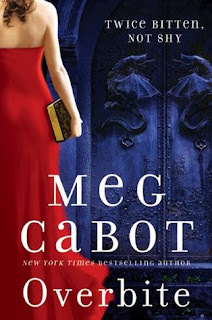 To learn more about Meg Cabot and her books, visit her website.You can also find her on Goodreads, Facebook, and Twitter. 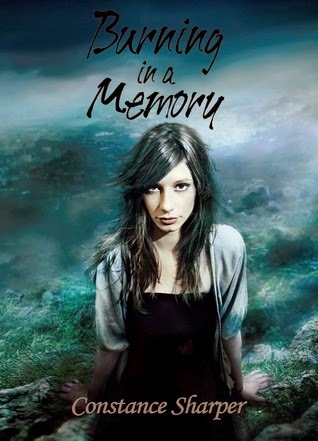 Burning in a Memory by Constance Sharper was pretty entertaining from start to finish. I'll admit, I was a little confused at times, because I didn't fully realize what Adelaide was up to. Even to the reader, it wasn't always clear. Sometimes I thought she was an innocent(especially in the beginning) while other times I thought she was running a scam, but it all plays out and is explained fully by the ending. There is a romance. There could almost be a love triangle if this turns into a series. I'm not sure if this is going to be a series, but I think it easily could be. It seems like Adelaide's story isn't finished yet. 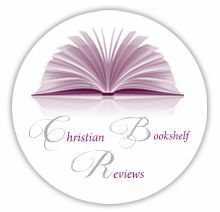 Burning in a Memory by Constance Sharper was kindly provided to me by the author for review. The opinions are my own. The sound of twisting metal chilled her to the bone, but she forced her muscles to remain lax. The wind whistled by, fiercer than she’d ever heard it, and took agonizing moments to calm. She let out an embarrassing moan of discomfort when it finally ceased. Her anchor to the rock fissure remained intact and the tips of her boots planted firmly on the rock wall’s deformations. Finally remembering how to move, she released her white-knuckle grip on the sling and reached out for the mountainside. Her fingertips brushed it idly before she found a place to dig her nails in and she lifted the last of her weight off her safety line. With lowered morale, she continued her climb up the mountainside. The sun beat down on her back and glinted brightly off of each notch of rock. Every inch had become painful after her two slips and near misses. She didn’t dare peer below to see how far the ground appeared; instead her eyes remained glued on the nearest shelf. The tour guides had described this as a rock climb of moderate difficulty because the shelves were considered cheating by experts. She couldn’t care less about looking like a pro, when the cliff offered her relief from hanging there any longer. Her phone’s buzz made her flinch and loosen her grip. The immediate loss of control left her gripping at stone until her nails bled and she felt secure. She shot her phone a dirty look, seeing its blue glow even through the thick denim fabric of her skinny jeans. She neglected the desire to try to wrangle it out from clothing wholly unsuitable for her current task, and let its shrill ring die on its own. The incessant buzz was an alarm reminding her of the time: five o’ clock. She paused during ascent, partly to take a desperate breath and partly to scan the area. Adelaide hadn’t made it as far as she’d expected this far into the climb. The sun threatened to leave the sky in a few hours and leave her in chilly darkness. The crunch on time left her hopelessly gazing over the side of the cliff for other climbers. She hadn’t seen anyone else like she’d expected and it made her nervous. Maybe all of the good rock-climbers knew something she didn’t. She forced herself to focus on the shelf above. Between her sweaty palms and blistering feet she welcomed the break. When she finally reached the ledge, a second wave of energy slipped through her body. Throwing her leg over first, she used her thigh muscles to hoist the rest of her body up. Feeling secure, she freed her cam and then drilled it in a fissure above her. The wind had been decent this far, but she refused to trust Mother Nature this high up. “You’re cheating and taking the easy way out,” a voice carried from somewhere nearby. “Hey, I didn’t even feel like coming out today. 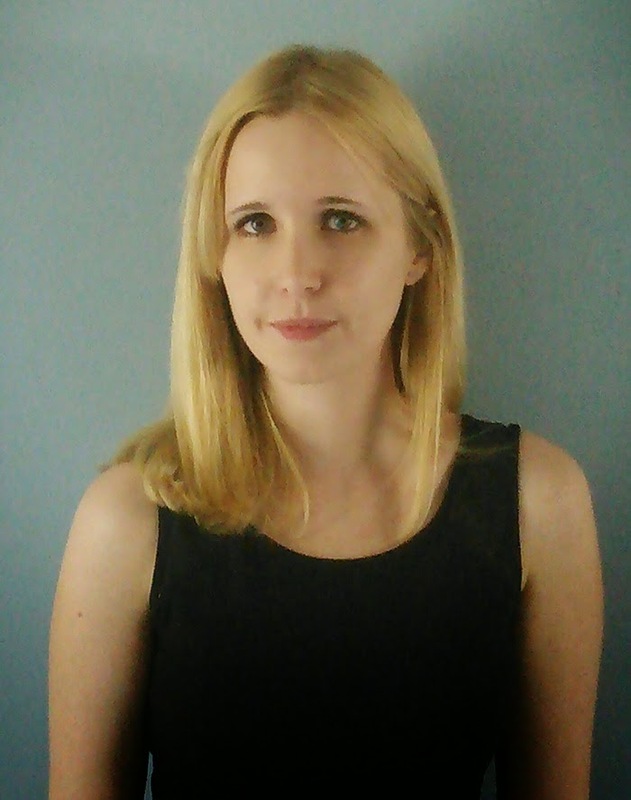 You’re lucky you have company at all…” A girl’s voice seconded the man’s. Adelaide pinpointed the voices to somewhere below her. Adelaide moved into a crouch, feeling for the first time the push of a breeze near an unsteady edge. Peering over the side, she spotted two climbers in neon green gear crawling up the side. 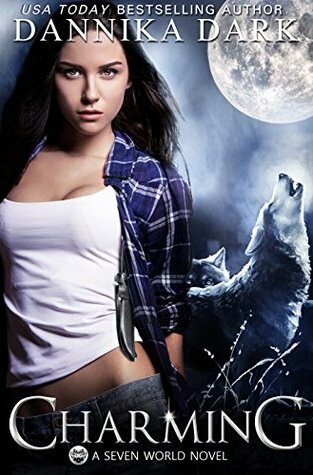 They’d made it up to a ledge just to the east of her position, but staring directly down at the top of their heads she couldn’t identify any distinctive features about them. They sounded young, close to her age. It made her wonder. “You aren’t going to fall anyway,” the male replied as Adelaide pictured his location in her mind. They climbed not far from the lower rock side plateau and she sat back when she established their location. Squeaks of metal and a hiss of rope reached her, a sound Adelaide recognized just in time for the scream that followed. “Angie!” The male hollered but his voice disappeared under the distinct thundering of a loose boulder. The rope unwound with a piercing whistle, and the rock’s collision with the side of the mountain made even the shelf where Adelaide rested tremble. The sensation snapped Adelaide stiff and using sheer will power, she crawled close to the edge again. Glancing over, she saw only the man still hanging. His attention remained below him toward a mass of distant rocks. “Angie, Angie!” He kept screaming until something soft and incoherent sounded back. It could have been a dire moan; Adelaide couldn’t tell. 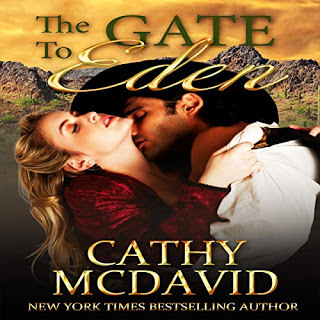 The man’s head snapped up instantly and his hazel eyes landed on her. His mouth dangled open, but scrutiny defined the wrinkles on his brow. He looked as surprised as she felt by her actions, but she didn’t stop while his companion was hurt somewhere below. “What are you doing?” he shouted back. His gaze slipped away and landed above her. Adelaide didn’t recognize the horror on his face, until something struck her. The blow to the side of her ear stung more than anything else, but the force also knocked her askew. The entire world sounded muffled now and she planted her hand on her wounded ear. Right hand still rooted to the ground, she felt the floor tremble beneath her palm. Her breath escaped her. The trembling grew to shaking, and the shaking grew violent. Her equilibrium lost, she staggered back when she stood. 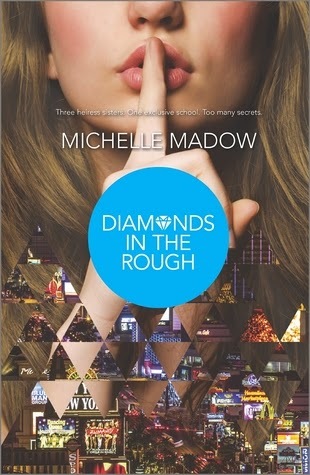 Her head slammed into the rock wall, and her chin snapped up. The mountain shifted, exploding with a massive cloud of orange dust before the mountainside collapsed. Focus too far gone, she didn’t realize she was slipping until her body slid free of the cliff. The drop, short and sudden, came to a jerking stop. Her rope caught her but she still dangled. Swinging her feet madly, the tips of her boots scraped the rock. Not even seconds had passed, but the world moved slowly. She never saw him move, but she felt his sudden grip on her belt. He held tight while screaming above the thunderous roar of the rockslide. His words sounded foreign, her brain stuffed with cotton, and yet she instinctually obeyed. The sensation of falling was only momentary. In the next instant, she was pushed up against him. Dust exploded and consumed the air. Eyes burning, she lost sight of him but felt his powerful grip. With another violent yank, the heel of her boots brushed the shelf. She gripped the stone, hoisting herself up. Pebbles slid first and the deafening plummet of rocks followed. She hurried before the trembling caused her to lose her grip. The pair finally reached the ground of the shelf as boulders exploded down the mountainside, but nothing struck them. Adelaide blinked her eyes half a million times before the sunlight pierced the dust storm. They stood in the middle of the impact zone but remained unscathed. She did a double take but couldn’t identify what didn’t make sense. The rocks glided over them, through the empty air, like they were standing under an unbreakable glass sheet. “Don’t budge,” he hissed. His voice sounded so much clearer, so much closer to home. When the last of the rocks split down the edge they still stood unharmed. He dropped his right arm back to his side and released her with the left. The dirt in the air made her lungs burn and she struggled to catch her breath. “No, don’t touch me. Don’t move,” she commanded. She desperately clung to the extra minute to reorient herself. The idea that one boulder had caused a rockslide felt foreign to her; she couldn’t wrap her mind around the fact that they still stood, in the wake of it all. Her eyes gazed back up to the sky. The mountainside above them now shined with clean slope. Lowering her eyes, she found that the rocks had piled up on the ground below. “Please. Um, just tell me your name,” he demanded urgently. She looked back at him, feeling hollow. Her mouth was dry so she only nodded. He offered his hand and she took it. He focused on her intently as he guided her to the left and drew her closer. The drop didn’t seem that far down now and he jimmied her rope in with his. 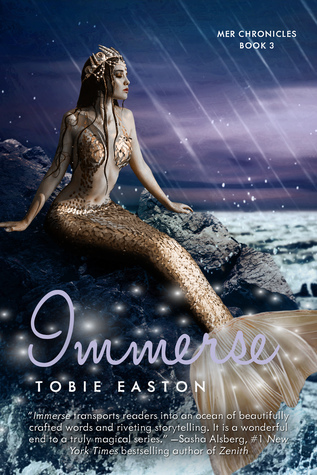 Adelaide’s mind never stopped spinning until their feet finally reached the rocky mass below. “What is your name?” she suddenly asked. His attention piqued and he seemed uncertain for a fleeting moment. “Yea, why?” she asked before she noticed the stumble in her steps. Her hand found her head, and pressed against the temple, finding slick blood beneath her fingers. The gash on her forehead felt superficial, but she recognized now that the thunderous crashing had stolen some of her hearing. He leaned closer, apparently studying the same thing she had. Her attention finally fell on his appearance, seeing him clearly for the first time. He didn’t stand much taller than her, at six feet, but he had more distinctive muscle mass. His skin had been sun-kissed and accented with brown hair and hazel eyes. Her studying came to an end when he backed up, and beckoned her attention. “I don’t feel sick...” she protested weakly, but accepted his helping hand anyway. The rough terrain made it difficult, but with her feet on solid ground, she didn’t care. She sized up the place. The rockslide didn’t cause much damage on the bottom of the mountain, but did cascade close to a newly tarred road. She couldn’t spot any cars nearby or hear any voices, but Adam marched them forward. He only slowed when they reached the roadside. “Your friend?” Adelaide cued quietly. “She would’ve gotten crushed. Unless...unless the rocks didn’t hit her either...” she muttered, doing little to contain the confusion in her tone. She knew he heard her, but he didn’t answer. His face turned away, he scanned the area. “Angie! Angie!” he hollered a few times. She never expected an answer, but Adam’s redheaded companion surfaced. The woman actually jogged out from behind a rocky obstruction, helmet in hand and a grin on her face. She slowed abruptly when her eyes landed on Adelaide. Angie stiffened and let her helmet fall to the ground. The woman had no apparent scratch on her, and only dust and dirt coated her skin. “There’ll probably be park rangers coming to the scene…” the woman added, clearly hesitant. Adam sent her a look that Adelaide couldn’t decipher, but she could feel the tension heavy in the atmosphere. Angie’s shoulders visibly slumped, and the woman remained silent. Adam chose that moment to inch Adelaide along, and she followed obediently. At long last, she finally saw the car that Adam had mentioned. A red Jeep sat not terribly far and was luckily sitting out of reach of the destruction. She shamelessly sized it up, memorizing the Colorado plates and the parking decals on the windows. “We’ll take her home where she can call someone. 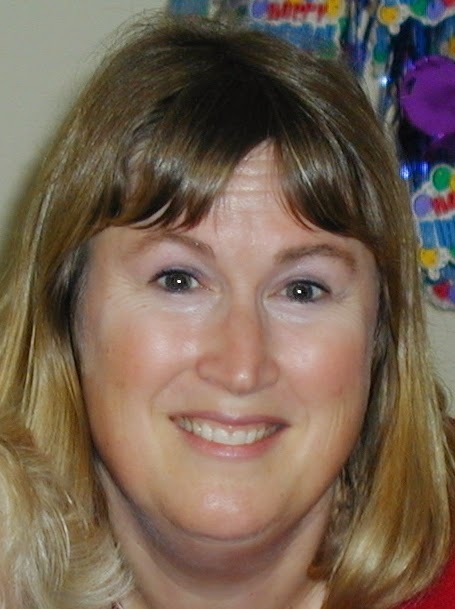 I’m not going to a hospital,” Angie declared as she sprang into the front seat. The Jeep’s suspension shook, and Adelaide took a few slow, assisted moments climbing into the back. Adam joined her there. His face seemed permanently wrought with lines now, but he kept his emotions to himself. Instead, he spoke with remarkable calmness. “Is that okay? Do you have a car you need to pick up?” he asked Adelaide. “Home is fine,” she said. Adelaide hesitated for a minute. The car was in gear and peeling out onto the road before she could spring out or think twice. After another minute, she found no harm in telling them where she lived and rambled off an address along with the nearest major street names. Angie gunned it when she had some direction. Even when the mountain rapidly disappeared in the rear view mirror, Adelaide never saw any emergency vehicles pull up. The highway appeared in a short amount of time– or at least it felt like it. Adelaide rubbed her ears, willing her hearing to come back. Adam, at some point, handed her a handkerchief. “For your...” He made a vague gesture to her head. She nodded, quick to rub away the blood she could. Head wounds always bled too much, she knew, but the sight of crimson made her stomach churn. “Will you have a ride to a hospital?” Adam asked. Up front, Angie groaned over dramatically. Her fingernails beat loudly against the steering wheel as she floored it back to the city. The tension in the cab alone felt overwhelming and an elephant sat in the Jeep with them. For the amount of speeding Angie did, it seemed like the trip still dragged on. Luckily, no one felt the need to fill the space with mindless, polite chatter. Only Adam spoke. “Just make sure you go to the hospital, okay?” he asked. His question calling for an answer, she turned to gaze directly at him. He shifted back against the wall of the cab. Her face spoke worlds when she said nothing. After a few minutes, Angie pulled up to Adelaide’s street, and, from there, Adelaide pointed out the right house. On a block where every house looked the same, the only thing setting it apart from the rest was its overgrown grass in the pavers. “Home sweet home,” Angie commented dryly from the front, a clear indication for them to disembark. Adam got out first and rushed for Adelaide’s door but she had beaten him to the handle. Her boots hit the ground and she proceeded slowly toward the house. Adam trailed at her side, only speaking when they were noticeably out of his redheaded companion’s earshot. Shock and adrenaline had worn down enough that Adelaide cleared her head. “Shush, please,” Adam interjected, almost begging her. His hands came out in a pleading gesture, but he didn’t reach out. She felt her face redden as she delved instead into whispers. They reached the door and Adelaide posted herself in front of the frame before he could offer to open it. The Jeep seemed both close and far away, and she never forgot about Angie sitting there. 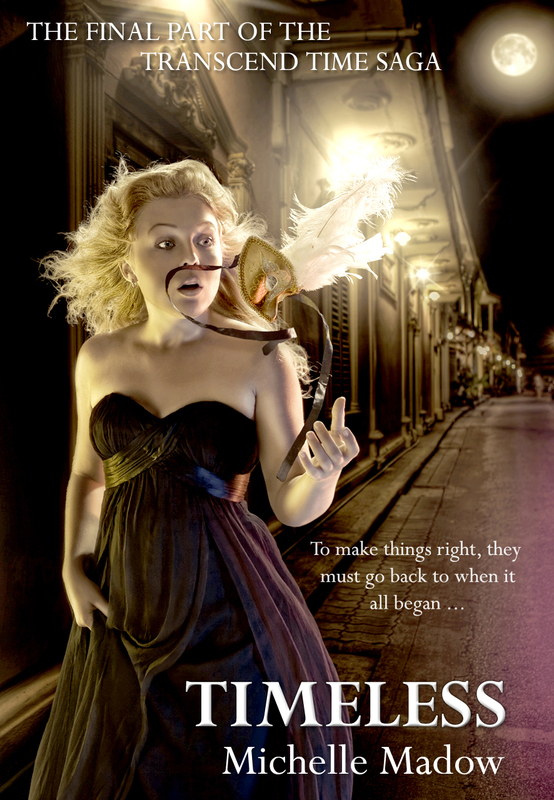 This time he did reach out, brushing her shoulder as if the touch would anchor them both to Earth. The gesture did more than exhibit a friendly goodbye, but a stranger’s beckoning for trust. 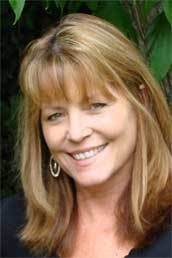 About their names, their tag, their car—or any of the identifying information she had gathered. He would be back, she knew then, because he wouldn’t risk not coming back now. And maybe he even cared; that thought left her with a weak smile. “Sold. Be safe now,” he said. She refused to go inside until Adam walked away, hopped in the Jeep, and disappeared down the street. A few moments passed before she jingled the knob. The door creaked as it opened, and the explosion of dust made her cough. She slipped inside and sealed it behind her. Between closed blinds and no lights, very little of the interior was illuminated. She strolled by the plastic covered couches and into the living room where the musty scent was the most minimal. The rugs had blackened and the coffee table dry rotted, but she plopped down in the only leather chair that remained uncovered. Shadows of frames once on the walls decorated the place, and the home resounded with absolute, bitter silence. 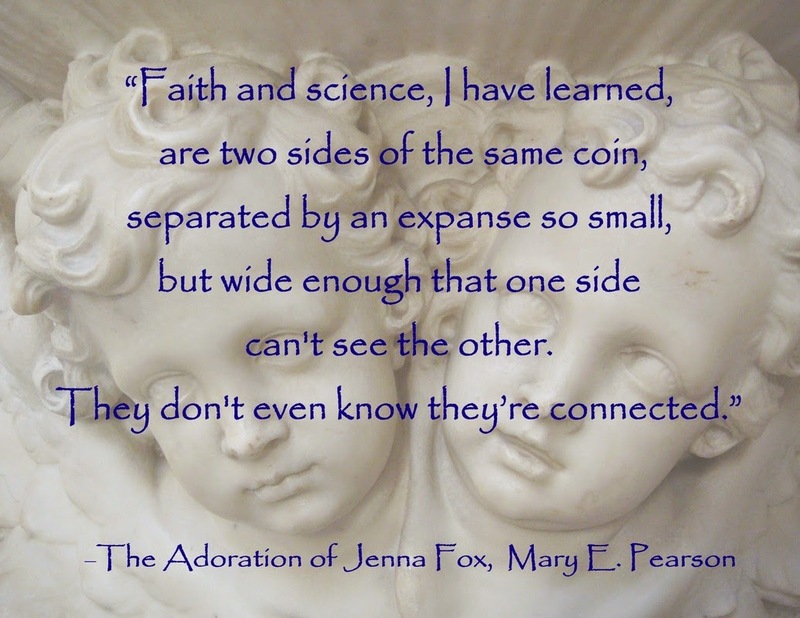 The Adoration of Jenna Fox is the first book in the Jenna Fox Chronicles by Mary E. Pearson. This was a quick read for me as it pulled me right into its world from the start. It's told from Jenna's perspective, and told in such a way that I could really see it happening in our future. It took things that are happening today and gave them consequences tomorrow. I found it to be very believable. I completely understand how a technology like this would be just as scary as it is exciting. This story makes you think. Jenna was a great character. She's shy and meek in the beginning..just goes with the flow. As the book progresses she really comes out of her shell. 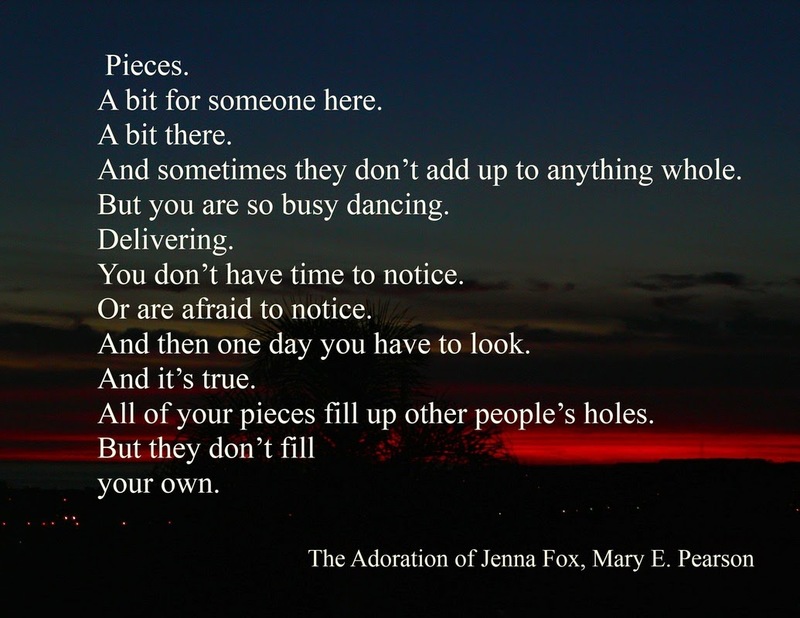 I felt for Jenna as she figures out who she is again. I felt for her parents, because no one should have to lose a child. Every character was significant to the story. I would love to learn more about Dean. What's going in in that head of his? As a bonus, there were many messages hidden within these pages, and I thought they told some things that need to be said. 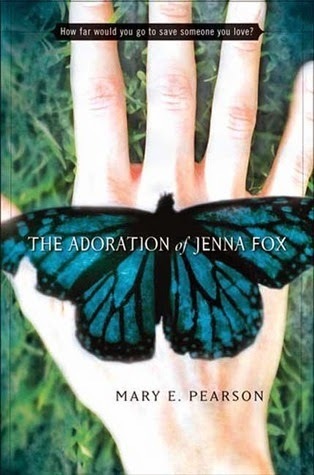 I won The Adoration of Jenna Fox by Mary E. Pearson through the Crazy Dream Blog.The opinions in this review are my own. I look at my fingers again, the ones that trembled and shook just a few days ago at Mr. Bender's kitchen table. I bring them together, fingertip to fingertip, like a steeple. Each one perfect by appearance. But something is not . . . right. Something that I still have no word for. It is a dull twisting that snakes through me. Is this a tangled feeling that everyone my age feels? Or is it different? Am I different? I slide my steepled fingers, slowly, watching them interlace. Trying to interlace, like a clutched desperate prayer, but again, I feel like the hands I am lacing are not my own, like I have borrowed them from a twelve-fingered monster. And yet, when I count them, yes, there are ten. Ten exquisitely perfect, beautiful fingers. I look at my fingers again, the ones that trembled and shook just a few days ago at Mr. Bender's kitchen table. I bring them together, fingertip to fingertip, like a steeple. Each one perfect by appearance. But something is not . . . right. Something that I still have no word for. It is a dull twisting that snakes through me. Is this a tangled feeling that everyone my age feels? Or is it different? Am I different? I slide my steepled fingers, slowly, watching them interlace. Trying to interlace, like a clutched desperate prayer, but again, I feel like the hands I am lacing are not my own, like I have borrowed them from a twelve-fingered monster. And yet, when I count them, yes, there are ten. Ten exquisitely perfect, beautiful fingers. 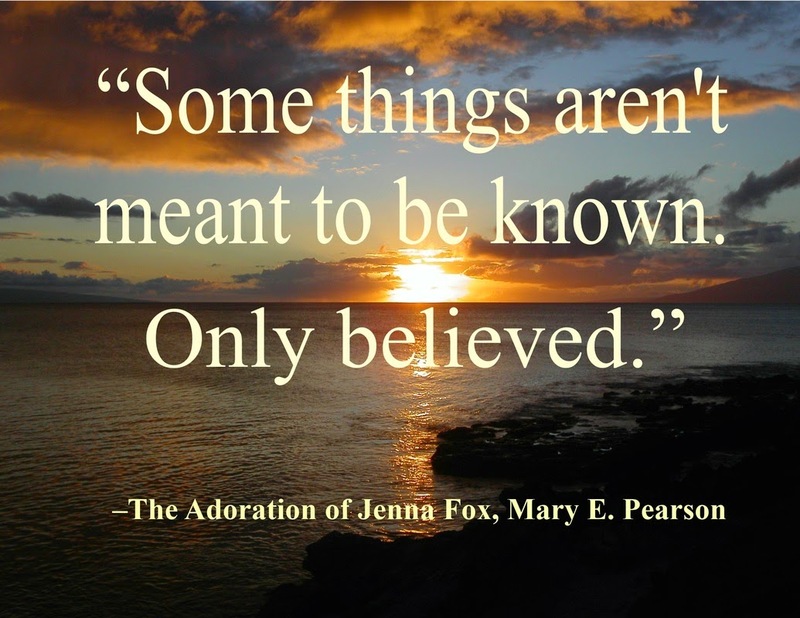 To learn more about Mary E. Pearson and her books, visit her website.You can also find her on Goodreads, Facebook, Pinterest, and Twitter.